Aurelinwae, an Altmer enchanter, is a merchant added by the Wizard's Tower official plug-in. She works in the Mystic Emporium store in the Market District of The Imperial City, along with Calindil. 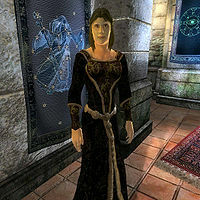 You will be pointed in her direction by Frostcrag's previous owner Taris Rendil in his memoirs: "I've entrusted most of my belongings to Aurelinwae at the Mystic Emporium in the Market District of the Imperial City. There you'll find everything you need to bring Frostcrag Spire back from the dead. She may require compensation for her time and care watching these special items, but I assure you, it's well worth the coin." True enough, she will sell you four upgrades for the tower as well as the two magetallow candles needed for the altars. She follows the daily routine of a typical Imperial City merchant, starting her day at 6am every day and heading to the ground level of the Mystic Emporium, where she will spend two hours wandering around. At 8am she will start offering her services during a long period of twelve hours. At 8pm she will head to The Merchants Inn to have dinner for two hours. After she is satisfied, she will take a long walk towards the Arboretum, traveling through the Green Emperor Way en route. After she has relaxed after a hard day of work, she will finally head back to the Mystic Emporium at 12am to sleep for six hours. The only exception to this schedule is during Light the Dragonfires, when all residents of the city are confined to their homes under martial law. She wears a simple set of common upper-class clothing, consisting of only a black & burgundy outfit and a pair of gold trimmed shoes. She also carries a copy of the Mystic Emporium key and a small leveled amount of gold. Aurelinwae doesn't wield any weapons, choosing instead to rely on a set of higher-level spells from all the magical schools. Aurelinwae is one of the best merchants in the game, both because she (along with Rowley Eardwulf and Nilphas Omellian) has more gold available (2000) than any merchants, and her Mercantile skill (6) is much lower than other merchants. Frostcrag Spire: In the frozen mountains of Cyrodiil stands Frostcrag Spire, a tower of wonders for your magic-oriented character to call home. If you have the Fighter's Stronghold official plug-in installed, a bug might prevent you from entering the Mystic Emporium and thus you won't be able to purchase the upgrades to Frostcrag Spire. See the Mystic Emporium bugs section for a workaround of this. She may be affected by the let me do that one again glitch. Every item you sell her will remain in her inventory. This can lead to long pauses if her inventory gets too full. To limit or avoid this bug, only sell expensive items to her where the price difference between her and other vendors really matters. When asked about Rumors, she may tell you, "Calindil runs a nice place at the Mystic Emporium", as if she wasn't at that location. This page was last modified on 20 May 2018, at 06:27.